Providing you the best range of itraconazole bp capsule with effective & timely delivery. 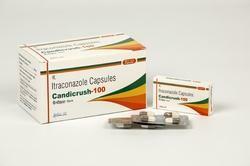 Itraconazole capsules are used to treat fungal infections of the toenails. Itraconazole is an antifungal medication that fights infections caused by fungus.Itraconazole is used to treat infections caused by fungus, which can invade any part of the body including the lungs, mouth or throat, toenails, or fingernails. Vomiting, diarrhea, headache, stomach upset, or dizziness may occur. If any of these effects last or get worse, tell your doctor.